The harmful effects of sustained sitting in poor posture and the health of the neck and back are well documented. Most of the emphasis has been placed on sedentary occupations – sitting for extended periods at work. However, how people sit at home or during leisure hours can impact on the health of the neck and back both in and out of working hours. Postures popularly assumed in recreational or leisure seating lead to cumulative damage to soft tissues of the spine – muscles, ligaments and discs. These effects may still be present at the start of the following work day. In the prevention of work disability caused by sustained sitting, one must consider the impact of leisure seating design and recreational sitting behavior. An estimated 75% of work in industrialized countries is performed while sitting, a statistic that warrants the extensive scientific investigations into office seating and sitting posture that have been conducted over the past 4 decades. Interest in occupational health and safety at governmental, managerial and media levels is reflected today in a well informed public which is largely aware of the importance of good office seating and posture in diminishing pain from seated tasks. However, making posturally healthy seating choices and adopting sitting postures that optimize spinal health in leisure hours is rarely addressed by health professionals, seat designers or the public. 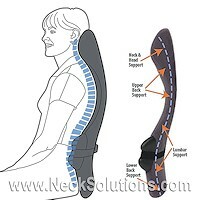 Consideration of leisure hour seating as a cause of lower back pain is therefore important. The manner in which a person sits in leisure hours can affect the health of the spine in office hours. Many advertisements for lounge seating encourage a lack of postural support, equating comfort and relaxation with poor sitting postures in modular lounges or seating with concave or hollowed back rests as in the pictures above. Advertisements highlight aesthetic dimensions, focusing on architectural trends, designs, and designers based on a variety of concepts, particularly those concepts that appeal to the perceptual senses. These designs are often described as functional despite either a lack of stability or a lack of adjustment, padding, recline and contouring. If one considers that much of our leisure time is spent sitting and that recreational seat design is often designed to invite poor postures, there is a need to extend the understanding of the effects of sitting and seating beyond the scope of the office. The amount of pressure in the disc is affected by the manner in which one sits, with the body either flexed forward or upright. There is 40% more disc pressure in a poor sitting posture (unsupported – slumped) compared with standing. There is an increase of 85% in disc pressure when leaning forward in a poor sitting posture. Therefore, when the lower back is compressed, there is a greater increase in disc pressure in poor seated posture compared with positions which maintain the lower back (lumbar spine) in the neutral or normal back posture. Consideration must also be given to the effects of muscle and ligament tension on disc pressure. An increase in disc pressure in poor posture when seated is caused by alterations in the center of gravity, load distribution and ligament tension. When the lower back is flattened from poor sitting posture, loading on the front part of the disc is increased by the weight of the body acting downwards causing the disc to become deformed which stretches the back part of the disc, increasing the tensile force and high stress peaks. The resultant tensioning caused by sitting and forward bending dramatically increases the ligament force and is a source of potential damage to the ligaments and the disc of the lower back. Concave backrest design such as tub chairs, lounges that lack support because of soft upholstery and modular lounges inviting semi-recumbent sitting (half sitting and half lying down) enforce and/or encourage poor sitting posture. The ramifications of raised disc pressure on the health of spinal structures are significant. If the disc is compromised by sustained increases in disc pressure such as occur from sustained sitting in chairs with concave backrests or unsupportive upholstery, progressive degeneration of the disc may result. Therefore there is a link between extended periods of raised intradiscal pressure, as may occur in sustained sitting with poor posture, and disc degeneration. When sitting is sustained for prolonged periods without movement there is a sustained compression resulting in fluid loss from the disc. As the disc becomes severely dehydrated, nutrition is compromised and the process of disc degeneration is accelerated. There is a loss of shock absorbing capacity with increased risk of injury to the disc and other spinal structures. There is a loss of disc height which increases the potential for a pinched nerve. This stresses the importance of movement while sitting to avoid these damaging effects of prolonged static sitting and posture related pain. Until the disc reaches the pain threshold due to structural damage, there can be little or no pain felt. It is this absence of pain that promotes the misconception of equating health with the comfort that may be achieved by sinking into a “cloud of cushions” or relaxing on modular lounges. Increased disc pressure from poor sitting posture may position the inner portion of the disc (annulus) to move backward and, along with the increase in pressure, may cause a vulnerability to disc herniation. There is a significant diminishing activity of stabilizing muscles in the back called the multifidus that occurs in within 15 min of sustaining a poor sitting posture. When poor sitting posture is prolonged because of the shape of the backrest, the lack of support of upholstery or poor postural habits, the stiffness of the spine and stability provided by multifidus is significantly reduced and spinal structures are at risk of damage. The multifidus is one of the only muscles to provide direct stabilization to the lumbo-sacral joint (L5-S1) which is often involved with degenerative changes. The damage is associated with loss of multifidus reflexivity and hyperexcitablity, acute inflammation in the ligaments, the tissue surrounding muscles called fascia, discs and capsules of the joints behind the discs often involved in facet joint pain syndrome. Loss of stability during or following sustained pressure that occurs in lounge or dining chairs encouraging poor posture therefore poses significant risk of injury to the lower back. The potential for harm is compounded by the fact that vulnerability from poor sitting is not resolved even by generous rest periods and are evident for a period 60 times longer than the time it took for them to develop. The stretching effect of increased pressure may still be present in spinal structures as long as 7 hours after rising. So, residual damage from a working day may still be present at the start of the next working day thus predisposing the lower back to cumulative trauma and this situation is compounded if leisure hours after work are spent in lounge or dining seating in sustained poor posture. This process may also be extended to problems with neck posture. This potential for damage from poor seating design and sustained sitting postures emphasizes the need for recreational furniture design that supports the normal lower back position. It further mandates the role that health professionals have in advising frequent movement while seated by taking frequent minibreaks or using a product like the Active Seat Cushion, in particular on long haul flights and road trips, and the passive maintenance of proper posture while sitting both inside and outside the office through seating design and augmenting with back support devices when possible. A long period of sustained sitting followed by retrieval of heavy luggage using a bent and rotated lower back is potentially hazardous to spinal structures. 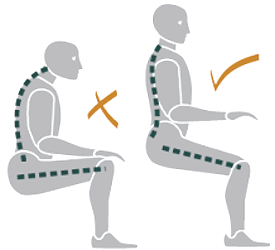 There is a simple sitting back exercise that is easy to perform and may provide relief from back pain due to sitting. Poor seated postures can effect more than the back, a 2014 edition of the journal Neurological Sciences, indicated that poor sitting posture maintained for prolonged periods may be a cause of neck-tongue syndrome. This is not a common condition, but causes one sided neck pain with possible numbness, along with tongue numbness and possible spasms on the same side of the neck pain. Sitting in bad postures not only can cause back pain, but can result in problems with tilting of the shoulders as well as forward posture of the head and neck. Over the long term, this can lead to neuromusculoskeletal pain – pain from the nerves, muscles, tendons, ligaments and joints. The stomach muscles are usually weak with many back pain conditions. The abdominal muscles are less active when sitting compared to standing. Particularly, both the oblique abdominal muscles are less active when sitting, and the external oblique muscle is specifically more inactive when sitting with the legs crossed. A 2016 study in the Safety & Health at Work journal found that sitting in a slumped position caused right and left internal oblique and transversus abdominis muscles to weaken, thus compromising spinal stability and posing a risk of injury. The authors found these muscles weakened earlier than other muscles tested by EMG (about 20 minutes) after sitting in a slumped posture as compared to sitting straight or leaning slightly forward. Regardless of posture, discomfort scores significantly increased after 1 hour of sitting for the neck, shoulders, upper back, lower back, and buttocks. When sitting in a slumped posture, the multifidus muscles are stretched over time as the internal obliques and tranversus abdominal muscles increase contractions to balance the system. The resulting fatigue causes structures in the lumbar and pelvic regions to bear excessive weight, leading to back pain and possible injury. We know that our society spends more and more time sitting, with the advent of automation, technology and science. 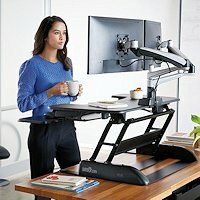 We depend on vehicles for traveling and spend more time in poor posture sitting at computers. 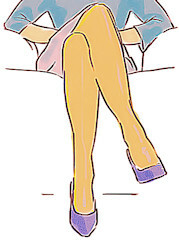 It is not uncommon to see individuals sitting with the legs crossed. This can be to shift weight or for reasons like proper manners when wearing a short skirt. When sitting for long periods, sitting crossed legged can help reduce fatigue of the trunk muscles. However, extended periods with the legs crossed can cause problems with blood pressure, varicose veins and strain from an unstable posture. Crossing your legs can result in pelvis rotation and subsequent torsion strain in the lower back. Pelvic tilting from crossed legs can lead to weakness of the hip abductor muscle of the legs that is crossing over the other. This also results in weakness of the gluteus medius muscle on that side. 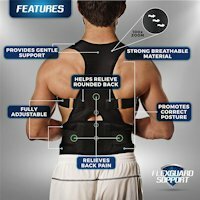 All this produces an unstable muscular support system that is more prone to pain conditions. A 2014 study in the Journal of Physical therapy and Science found that sitting with the legs crossed for 3 hours per day had a negative effect on spinal posture. This not only effected the pelvis and lower back, but effects were seen with shoulder posture as well as forward head posture, which is common in neck pain conditions and headaches. So, individuals may adopt poor while sitting for a number of reasons. These reasons include chair design, habitual practice, lack of motivation to adhere to principles of good seating practice in the office, perceived comfort and societal reasons. It is important that health professionals stress that the onset of their back pain is often insidious, and seated postures perceived as comfortable in the short term may be detrimental to the health of the spine in the long term. The principles of healthy seating apply in leisure hours just as they do in office hours. In particular it is important to note that the current fashion for sitting while watching television or working on a laptop places the spine in poor posture with potential for spinal damage that may extend into the following working day. Lounge chair design which encourages long sitting, unsupported modular seating, beanbags, and seat designs such as the concave bubble and egg chairs all facilitate poor sitting posture. There is a misconception among designers and users of lounge seating that relaxed postures are comfortable and that comfort equates with health. However the maintenance of such postures creates poor spinal health. Sustained poor postures are insidious in that they contribute to degeneration but pain does not occur until degenerative changes appear. Repetitive and long term poor sitting posture affects ligaments, muscles and joints and lead to cumulative traumatic disorders. Maintaining a poor seated posture while dining, viewing TV or traveling can compound the ill-effects from the working day, creating further potential for damage.